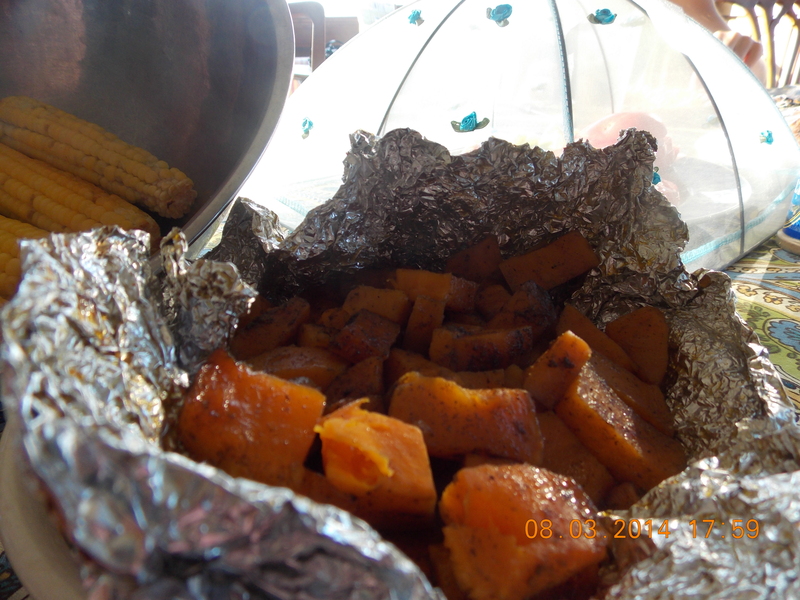 Grilled sweets are spicy, smoky and sweet. Pick a packable (potable) lunch with no more than 600 calories, 5 g sugar and no fat, for example. I’m making up this illustration, but all the challenges pretty much circled around to the same answer: You can’t eat well without a lot of vegetables and only dribs and drabs of other foods. That’s it. Get used to it. Fill up your plate with tasty, uber-fresh vegetables and then tuck protein, carbs and even fruits around the edges. Kale really is the answer to just about any food challenge. And this is the best time of year to eat vegetables. From our little garden we’ve enjoyed green beans, sweet corn, a Moon and Stars watermelon, sweet peppers, cucumbers and summer squash. The tomato wave is just beginning — the crest touching politely onto the beach, to be followed within the week by truckloads. All at once, natch! Sweet potatoes aren’t really a summer vegetable (they’ll start to dig them in eastern North Carolina soon, though), but Sunday night they were the perfect grillmates for corn on the cob and an herb-marinated pork tenderloin. The directions said they’d be ready to eat in 20 to 30 minutes, but we knew better than that. Try 1-1/2 to 2 hours! I’m sure that means our fire wasn’t hot enough or something like that, but the other foods we grilled were done in times given. So maybe potatoes are just super difficult to reduce to moosh which is how I like my potatoes. Cook on grill until the cows come home. Leftovers can be reheated. 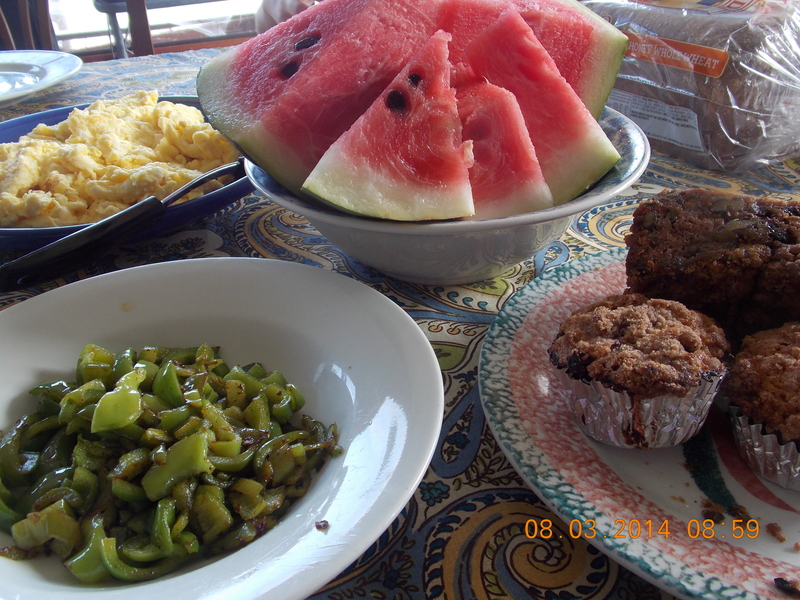 Breakfast from the garden includes the summer’s first watermelon, sauteed sweet peppers, zucchini bread and blueberry muffins! Previous: Previous post: Squashed, again! Next: Next post: What does a fresh corn souffle have to do with depression?